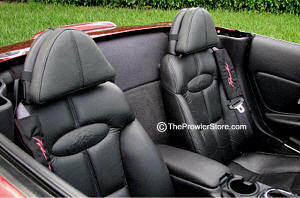 SHRK-HRC2 Plymouth Prowler Deluxe Headrest Pad set. Plymouth Prowler headrest pad in is a French seam down the center of the headrest which matches the French seam the factory used on the upholstery. The headrest are removable and held in place with third Velcro straps.